These unique shotguns are intended for professional and amateur hunting. They are chambered for various hunting cartridges. A unique design feature of combining the revolver configuration with the dual action firing mechanism ensures reliable functioning and enables double and single action firing. The hunter can also fire from any cylinder chamber at his discretion. Classically designed, the buttstock and the forearm are made of beech or walnut. Cartridges are loaded one by one, and the fired cases are extracted simultaneously. For loading and unloading, the cylinder is swung leftward. The bore is chrome-lined. The barrel has replaceable muzzle devices. The article talked about the pros and cons of some of the turret shotguns MTs-255, due to limitations on the use of cartridges in the model MTs-255 12 gauge, and given some recommendations for choosing cartridges. Revolving hunting shotgun model MC 255 developed at the Central Design Research Bureau sporting and hunting weapons (TsKIB SOO) in Tula, in the 90s. 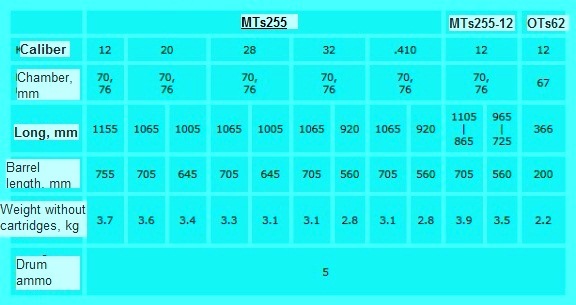 At the moment the gun is available in five calibers (the second digit after the caliber 255 MTs): MTs-255 .410, MTs-255-32, 255-28 MTs, MTs-255-20, 255-12 MTs. High demand in the CIS and abroad rifle calibers: .410 MP-255, under the bullets .410h76; MTs-255-20, at 20h70 and 20h76 cartridges "Magnum"; MTs-255-12, for cartridges 12h70. Revolver shotgun model MTs-255 foothold in the market with the advantages of hunting weapons shopping design, simplicity and high reliability singly rifles. Turret guns occupied a niche between the double-barreled guns and self-loading. 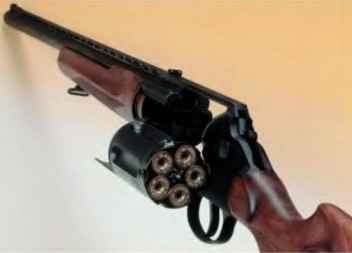 Revolver shotgun makes it possible to fire the cartridge necessary equipment (five cartridges can be charged in the drum). You can shoot at different game, a different distance by using the possibility of silent rotation of the drum. If all of a sudden there was a flash in the pan, then, as in the turret, you need more time to pull the trigger or rotate the drum manually. The shotgun turret MTs 255 used hunting ammunition calibers corresponding with paper, plastic, metal sleeve in any gear, including ammunition for shooting fur-bearing animals over short distances. This is an advantage over semi-automatic shotgun, automatic which such cartridges do not always work reliably. The cartridges filled with a metal sleeve is necessary to pay attention to the strength of fixing the projectile shot to shot during the eruption did not happen fraction of the other patrons in the drum. Chucks with rolling (plastic) or seaming "asterisk" not interfere carefully and gently boil near "sprocket", for example, using a heated nail. Factory ammunition is necessary to examine and if necessary to drive through a twist to insure against a rash shot. cranking the drum (wedges), a misfire, poor extraction of spent cartridges. After further studies in TsKIB COO provides some guidance. It was established that the gun MTs-255-12 normally work with cartridges height of the base of the sleeve 12 - 16 mm at a maximum pressure of powder gases from 500 to 650 kg / cm2, with the height of the base of the liner 7 - 10 mm at a maximum pressure of powder gases from 400 to 450 kg / cm2. These requirements are fully met in the cartridges, "Vetter" hunting, the height of the base of the sleeve 12 and 16 mm; "Taiga" hunting, the height of the base of the sleeve of 12 mm or more; "Rio 50" hunting, the height of the base of the sleeve 16 mm; "Fetter" Sporting, height of the base of the sleeve 16 mm; "Azot" Sporting, height of the base of the sleeve 12 mm. A branch of the Instrument Design Bureau "TsKIB SOO 'appeal was made to all Russian manufacturers of hunting cartridges, and proposed to use in the manufacture of cartridges of 12 caliber shells, which have a base height of 10 - 16 mm or bottom use plastic wads. As reported in the press, after treatment TsKIB SOO the firm "Taiga" the production of ammunition was carried out using bottom wads, and stop failures of shotguns. Shotguns MTs-255-20 have a constant strong demand and positive feedback from owners. TsKIB COO hopes to support the manufacturers' cartridges, understanding of hunters and is confident that the advantages of revolving rifles exceed some inconvenience for hunters, which are connected with the necessity of matching ammunition for shotguns MTs-255-12.